?Another world is not only possible, she is on her way. On a quiet day, I can hear her breathing.? 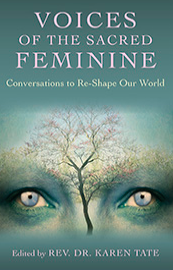 The focus throughout the book is on discovering, defining and strengthening the Divine Feminine in our individual and planetary consciousness, so that we may blossom the world into equality, compassion, love and spiritual wisdom. Many contributors point out the problems created by the global patriarchic culture: wars, staggering wealth inequality, racism, violence, greed, and the destruction of our planet?s ecosystems. This book is therefore an urgent, many-voiced call for planetary healing, through the resurgence of all that is female, holistic, balanced and nurturing ? and a beacon to help each of us to find our innate spiritual power, the God/Goddess within, our own ?Sacred Roar. ?